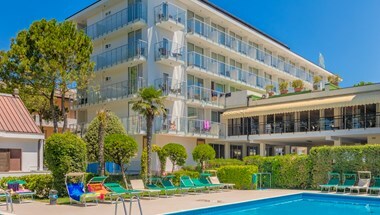 PARK HOTEL PINETA is situated in a seafront position in the beautiful setting of the eastern beach. Each of the 55 rooms of this 4-stars hotel is designed to allow guests to relax in comfort and style. All rooms are equipped with bathroom with shower or bath, mini-bar, LCD/Television, Internet Wi-Fi, shoe-rack and air condicioning. Hall rooms have a balcony with sea-view or garden view. In the beautiful Restaurant are served sea-food and meat specialty - Buffet of hors d'oeuvres, salads and grilled vegetables. 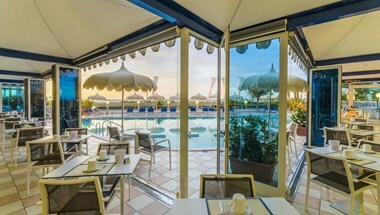 Breakfast can be enjoyed in the open air outdoors beside the pool. You can start your day in the sun, in the peace of the morning, tasting whatever you enjoy from our rich sweet and savoury buffet. The hotel has a reserved beach, reserved parking, heated swimming pool, palm-garden, roof-garden, fitness-center, free use of bicycles. Discounted Golf Club. To make your stay more pleasant, the hotel combines excellent service with modern conveniences. Heart, caring and passion are what we believe it takes to provide good hospitality. And for us, hospitality is a deep-felt commitment to our guests. A heartwarming vacation is a time to dedicate to ourselves and to the people we love. It is an occasion to enjoy the small, simple things of life, its scents and sensations. It means walking on the shoreline breathing the scent of the sea, feeling the softness of the sand, and listening to the waves. Located in a splendid, quiet position, seafront (Spiaggia di Levante – East Beach) the hotel Panoramic is equipped with every modern comfort. The comfortable surroundings, the pleasant and friendly atmosphere will make it fell like home. Exclusive, elegant and spacious rooms in which no detail has been overlooked, will make you stay pleasant and relaxing. Spacious dinning room, TV room, terrace bar, lift. 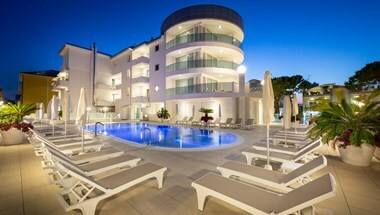 Pool and Jacuzzi, private beach with sun umbrella and sun loungers, parking, garage, bikes, WI FI. Excellent cuisine with many local and national specialties, meat and fish based. Hearty breakfast buffet. Surrounded by a cool and refreshing pinewood, the Hotel San Giorgio faces directly onto the sea in the quiet and welcoming resort of Porto Santa Margherita of Caorle, a traditional, picturesque fishing village. The peace and quiet you will find in our bedrooms is not to be missed. And there is also a high level of fittings and comfort: air-conditioning, satellite TV, minibar, radio, telephone, safe and hair-dryer. Our private beach located opposite the hotel has showers, toilets and a changing room. Beach umbrella and sunbeds free for guests to use. You can sit anywhere on the beach, spaces are not allocated. Swimming pool with hydromassage jets. Heated to 25° in the month of May and in late September. 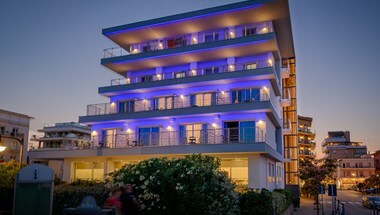 The Hotel Excelsior is a 3 stars hotel in Caorle, superior class, situated in a quiet position, just in front of the sea (West Beach), equipped with all modern comforts: swimming pool and whirlpool, parking, private beach with sun umbrella and sun loungers, air conditioning. All of the rooms have sea view and balcony, bathroom, air conditioning, telephone, hairdryer, satellite TV and safe deposit box. Some of them are communicating rooms. Comfortable sitting room, seafront terrace bar, lift, bikes, WI FI. Excellent cuisine with many local and national specialities, meat - and fish - based. Hearty breakfast buffet. The comfortable accommodation together with the high quality of services will assure you a pleasant, enjoyable and relaxing holiday. 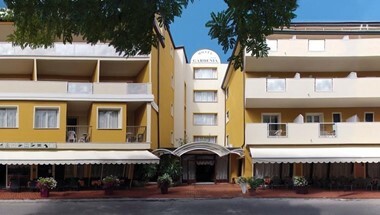 The Gardenia Hotel in Caorle, recently renovated, just 100 meters from the beach and 300 from the city center, has 65 rooms with bathroom, refrigerator, telephone, satellite TV, safe. There are also rooms for families with 4 beds and 2 baths. The enclosed parking area, a playroom for children and 100 meters private beach with sun beds and umbrellas for every room. 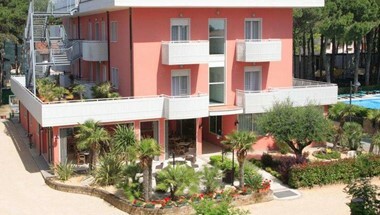 Hotel Tritone is favorably located facing the sea in the magical atmosphere of the historic town of Caorle. 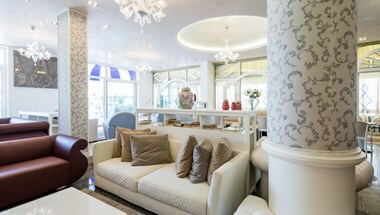 Here, guests can pleasantly spend their vacation immerse in a sophisticated and elegant atmosphere. Capable of satisfying even the most demandig visitor, cuddled by courteous hospitality, attentive to satisfy all their demands...and they can restore the strengths of both body and mind. Heated pool with Jacuzzi seafront. "To Give in order To Receive" is our motto. You will come as guests, but after having enjoyed our hospitality, you will leave as friends, with the wish to come again. 46 rooms with private facilities, bath or shower, balcony, air conditioning, refrigerator, telephone, television, hairdryer, safe, almost all with seaview. Lift. Air conditioned dining-room, lounge, INTERNET WI-FI, games room, television room. Bar with large panoramic terrace. Private parking - Garage. Private swimming-pool with hydromassage. Private beach with umbrella and sunbeds. MENU CHOICE. Salad Buffet. Breakfast with Buffet SELF-SERVICE. Located in quiet position, only a few steps from the sea (Spiaggia di Levante – East Beach), surrounded by a large garden, the hotel Villa Maria, recently renovated, offers comfortable surroundings, a cordial and meticulous service. A variety of accommodation options to respond adequately to all your needs are at your disposal. 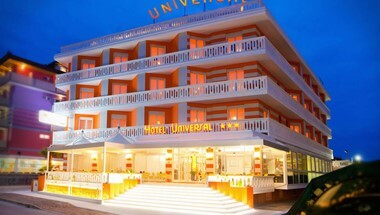 All of the rooms are equipped with bathroom, air conditioning, telephone, hairdryer, satellite TV and safe deposit box. Tv room, restaurant with air conditioning, comfortable terrace bar, lift. Private beach with sun umbrella and sun loungers, parking, bikes. The hotel is managed by Family Baradel which has a long tradition in hospitality management. The cuisine is well known and appreciated for its rich and varied dishes, local and national specialties, meat and fish based. Hearty breakfast buffet. 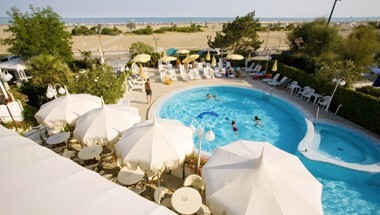 The International Beach Hotel is one of the most prestigious hotels of Caorle. It's located at few steps from the West Beach and from the historical city center. The ambience ist spacious, warm and confortable. The Molena Family has been working since several years in the hotel trade and will satisfy all your requirements to make your holiday unforgetable. Our services are dedicated to the whole family. The private swimming pool with its brand new hydromassage wille give the chance to relax and take care of your body shape. The high services quality and the professional staff will be able to satisfy each individual requirements. The Molena Family takes particularly care of its restaurant proposing you unique fine dishes of the traditional venetian cooking. The hotel, directly on the beach, is situated in a quite position, but at the same time close to the next pedestrian area. Privat swimmingpool with whirpool and solarium. Reading room and recreation room. Private parking. All the rooms are equipped with private bathroom (with shower and hairdryer), directal-dial, telephone, Sat-TV, safe, air-conditioning and balcony (room with connecting door are available). The Hotel Helen is in a peaceful location just a stone’s throw from the sea. Direct management by the owners and the hospitality and cordiality of the staff make it the ideal place for a restful holiday. All modern conveniences are provided for guests. The hotel also has a well-lit and fenced off private car park with spaces for all of its guests. We provide a high-class hotel complete with all the latest recreational and sporting facilities to satisfy even the most demanding guests who can choose from the wide range of entertainments available: parties, sports tournaments and many others. Rooms are provided with balconies and are complete with all comforts including: TV, air conditioned, automatic STD telephones. 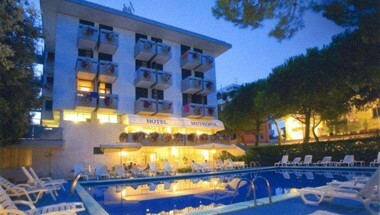 Excellent cuisine with à la carte menu, typical Veneto dishes, quick friendly service, buffet selection. The hotel has it own private beach with sun beds, deckchairs and umbrellas; other facilities include swimming pool with garden, tennis, jacuzzi, bicycle, car park. WI FI. 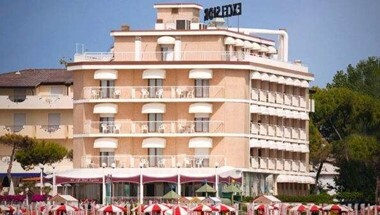 The Hotel Principe is one of the historic hotels in Caorle hotels. It is located in front of the sea, and the 3-star comfortable facilities have been recently refurbished in order to offer the best and most advanced comforts to our guests. A refined and friendly atmosphere will welcome guests since their arrival at the Hotel, thus creating the ideal ambience to benefit from the opportunities to take a rest offered by a holiday in Caorle at best. Each single space has been decorated with style and taking care of details, and is able to offer a high comfort, from the sunny entrance hall to the large rooms. 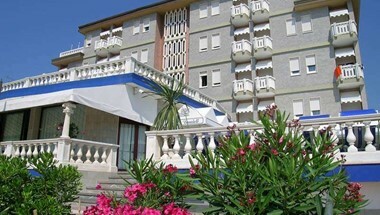 Staying in our hotel on the Adriatic coast is pleasant and relaxing. We offer our guests a wide range of services to allow them spend every time of the day at best: from the abundant buffet breakfast, to the lunch served in our spacious restaurant, where genuine and delicious local dishes are prepared. The Hotel is equipped with a heated swimming pool and solarium, where guests can take their ease and refresh themselves, relishing a sense of wellbeing for their body and mind. Miniclub and animation! Since its establishment in the ’50s Hotel Sara has always been a FAMILY-RUN business, a perfect combination of TRADITION and MODERNITY. THE SERVICES we offer are of the finest QUALITY so that our guests may enjoy an unforgettable holiday and feel at home in a relaxed and hospitable atmosphere. Hotel Sara is located in the picturesque BAY of the Madonna dell’Angelo Sanctuary on the outskirts of the old HISTORICAL CENTRE, so you will find yourself right at the heart of the most attractive places that Caorle has to offer; for example, there is the evocative promenade, a delightful criss-cross of narrow streets and squares (locally referred to as calli and campielli respectively), multicoloured Venetian-style houses and the main arteries of the town featuring locales and shopping areas. And above all there is the private beach opposite the Hotel with COMPLIMENTARY sunbeds and umbrellas. Hotel Sara also has its own garden and private parking facilities. The ROOMS are spacious, modern and welcoming and complete with direct line telephone, SAT-TV, safe, mini fridge, air conditioning and a balcony with a sea view. Located in splendid position, seafront and only several metres from the old town, the hotel Savoy *** with pool, is equipped with every modern comfort for a pleasant and relaxing stay. 62 elegantly furnished rooms (Standard, Comfort, Superior, Junior Suites, communicating rooms) with bathroom (shower-box), hairdryer, terrace sea front or lateral sea view with deck chairs, chairs and small table, air conditioning, fridge, Tv-Sat, telephone and safe deposit box. Comfortable dining room, terrace bar, lift. Included in the price: pool, private beach with sun umbrella and sun loungers, bikes, WI FI, fitness room, ping pong and parking. Healthy and genuine cuisine with regional, Mediterranean, national and international specialties, excellent selection of wines and meticulous service. Hearty breakfast buffet. 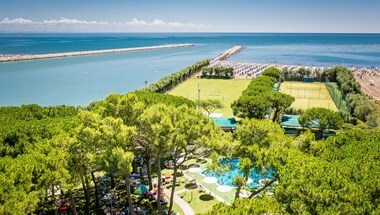 Marina Palace Hotel is located on Lungomare Trieste, in a splendid position overlooking the east beach, about 400 m from the old town of Caorle. Surrounded by a beautiful pine forest, it is ideal for families and those seeking a relaxing holiday. 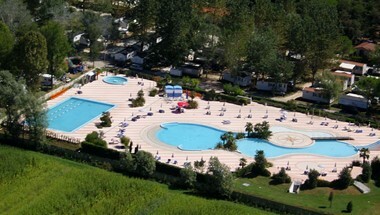 The hotel has a swimming pool for adults and children, spacious and comfortable common areas. 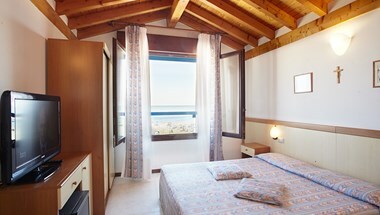 The spacious and sunny rooms have balconies overlooking the sea. Near the wonderful Caorle lagoon, between the scent of the sunny beach and the fresh shadow of the pinewood, few minutes far away from its picturesque historical centre, rich of culture and traditions, there you find Camping Laguna Village for a relaxing and peaceful holiday. Camping Laguna Village began to renovate its area in year 2000, today offers its customers the best way to rediscover the pleasure of a natural and relaxing holiday together with the whole family. Modern and comfortable structures, a wide range of services and the familiarity of our camping staff and animation team make Camping Laguna Village the ideal place for a holiday in which you and your family are the core. Besides water, electricity, gas connection and parking place for a car near the accommodation are included in the price. Bath towels and kitchen clothes are not available. You can rent bath towels by the reception office. Our accommodations are equipped with TV - Sat. 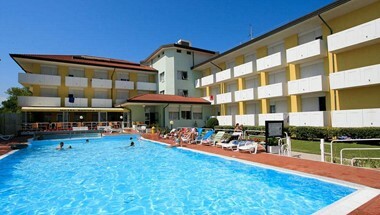 Sea facing and air-conditioned hotel with swimming pool, located in the most peaceful and elegant area of the Western beach of Caorle. 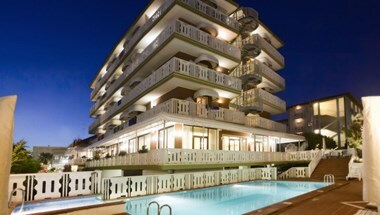 The hotel has a lounge bar with panoramic terrace, a lift, private parking places, and garages. 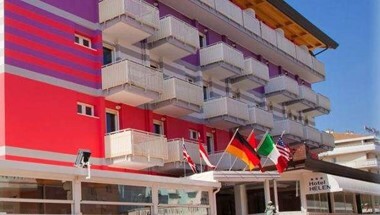 All rooms include: private bathroom (with shower or bath tub), hairdryer, telephone, satellite TV, safe, and balcony. The furniture has recently been renewed. Breakfast included; possibility to book Halfboard. A rich buffet breakfast will be served in the wide room of the hotel until 10.30 a.m., while the meals will be served in the air-conditioned Restaurant “Panfilo” (located about 300 metres from the hotel). Private beach with sun umbrellas and sun chairs included in the price.